What Are Allergy Drops - MICHAEL L. LEWIN, M.D. Allergy drops are a form of immunotherapy formulated to be taken as drops placed under the tongue (sublingual immunotherapy). 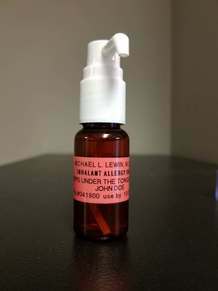 The drops are prepared by Dr. Lewin for each patient to treat their specific allergies using FDA approved antigens (the same antigens used for allergy testing and injections). Allergy drops are an extremely safe, effective, easy to use, at-home treatment. Because they are taken at home there is less cost and less time spent at the doctor’s office. In addition to treating environmental allergies such as dust, animal dander, pollens and molds, allergy drops have the additional advantage of being effective in the treatment of food allergies and formalin allergy. Formalin is a formaldehyde derivative which is an ingredient in or byproduct of many cleaning products, fabrics, dyes, laundry products, personal care products, glues, carpets, and wood finishes. Environmental allergy drops are taken every day throughout the year to stimulate your immune system to produce blocking antibodies to a broad range of indoor and outdoor allergens such as pollens, animal dander, dust/dust mite, and molds. This safe, effective at home desensitization process requires just 3 drops a day placed under the tongue. Food allergy drops are taken every day throughout the year to stimulate your immune system to produce blocking antibodies to a variety of different foods. The most common foods (which account for 90% of all food allergy reactions) are milk, eggs, peanuts, tree nuts (walnuts, cashews, almonds, hazelnuts, pine nuts, pecans), fish, shellfish, soy, and wheat. Allergy drops are recommended when avoidance is not possible or practical. This safe, effective, at-home desensitization process requires just 3 drops a day placed under the tongue. Food allergy drops can minimize your allergic reactivity to specific foods and can help mitigate the risk of a severe reaction. Preseasonal allergy drops are recommended for use in conjunction with year round environmental allergy drops. These drops are prepared and dispensed by Dr. Lewin prior to the emergence of each of three pollen seasons. Tree pollens emerge first in the early spring, followed by grass pollens later in the season and in the late summer to early fall by ragweed pollens. This treatment is designed to prepare the body for the upcoming pollen season and is given in advance of the pollens emerging. The course of this treatment is typically about six weeks from start to finish and is extremely effective in controlling symptoms of seasonal allergies. High Dose allergy drops are a targeted immunotherapy for many common environmental allergens. This immunotherapy utilizes a concentrated antigen specific formula to address this type of allergy. If you have one specific allergen to which you are reactive, such as mold, dust, dog or cat, this type of therapy might be recommended. In specific circumstances, this type of therapy may be used to supplement your year round allergy drops.